Having grown up in San Diego, I always felt like all other zoos in the world were probably just little picket fences surrounding whatever local wildlife could be acquired. I mean, obviously nothing would ever compare to the world famous San Diego Zoo. When I look back over some of the things I have thought in my adult life, I realize just how sheltered my expectations and imagination have been. I don’t know why it took me 10 months and some arm twisting to finally make it out to the Prague zoo, but I am ever so, so glad I did. Technically, it was my first ever real field trip too. 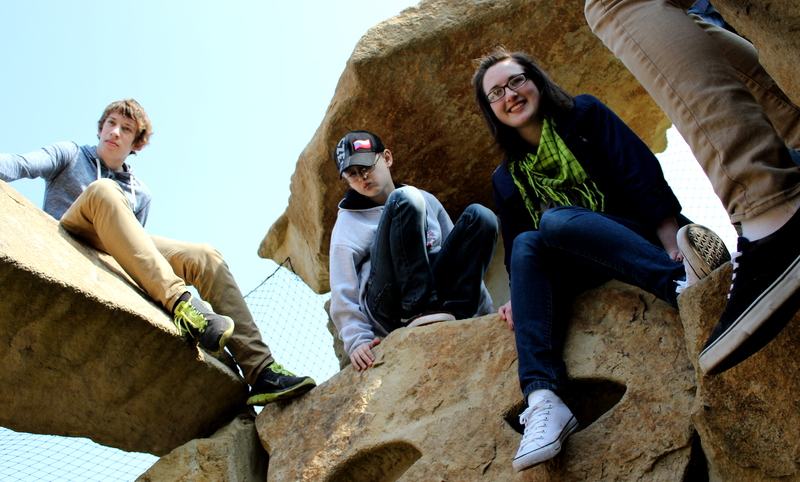 My officemate, Jarka, and her brood of eighth graders, paraded through the chilly spring sunshine, giggling, pushing and playfully trampling each other’s feet. It’s not every day we get to go to the zoo! I only teach a handful of eighth graders but I have met quite a few in my efforts to sign students up for the English Spelling Bee I’ve been organizing. My presence, I feel, has become a sort of anticipated terror and my reputation for pressuring students into doing things that are good for them has a thrilling infamy. Obviously, I couldn’t be happier. But there were a few new faces as we all crowded onto an unsuspecting bus headed toward the Kačerov metro. We spoke English. We spoke Czech. We laughed loudly enough to make other passengers feel uncomfortable. I try to be a good example but I am not always sure I am mature enough to be a chaperone. I would rather be the one causing trouble. Forty-five minutes seemed like three and a half seconds and before I knew it, we were standing in front of a very unassuming park entrance. The San Diego Zoo lets you know it’s there when you’re still miles away. When you stand beneath it’s towering gates you are guarded by enormous plants that have been trimmed into elephants and giraffes. There’s no mistaking where you are; no accidentally thinking, “Oh, all this time I thought this was convenience store or a gym or something boring.” No. IT’S THE ZOO. THE SAN DIEGO ZOO. The Prague zoo is a little more low key. There are cute animal footprints in the concrete leading up to a tiny set of unmanned gates. Stick your ticket in and you’re through. On the other side there are no people begging to take your photograph, no face artists or over-priced souvenir shops. Heck, there weren’t even any peacocks wandering around. I settled into the synchronization of my low expectations and the apparent reality pretty easily. I was here for the students anyway. There’s nothing more fun than watching kids have fun. They shrieked and joked and pointed. Somewhere between the black swans and the cheetahs we all split into groups. Jarka and I followed a few curious kittens into the reptile house which also sheltered a huge fake python lying across the floor (the first girl who saw that and didn’t realize it was fake nearly fainted) and two large tigers (real) who pressed against the glass, blissfully unaware of the 14 year olds cramming to get a picture with them. 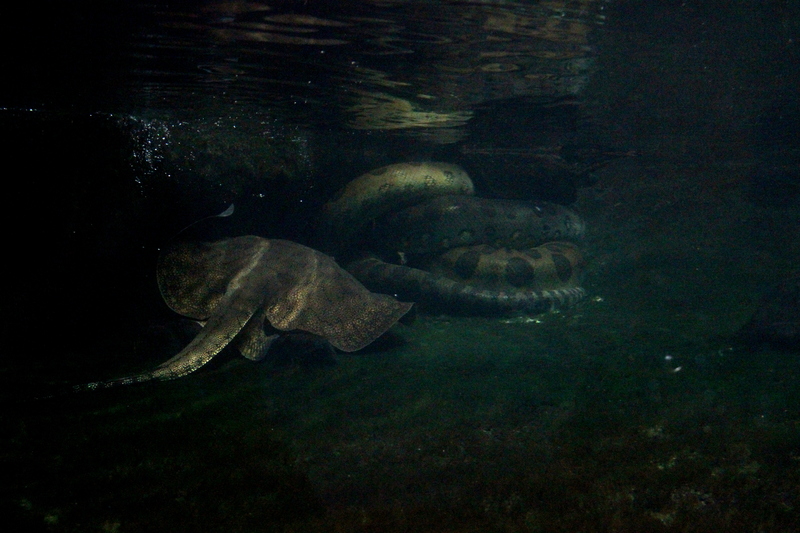 I want to draw your attention to the fact that there are FOUR different large snakes cuddling in this tank of water why a ray looks on sort of pervishly. NOT OKAY. Eventually the group whittled down to just Jarka, me and a chipper girl with freckles and strawberry blonde pigtails. Her valiant attempts to keep up with our all-English conversation were both endearing and amusing. But she hung in there. Through the green house that felt like a hot day in Florida, up the Skyfari which gave us a brilliant view of Prague Castle, the Vltava and the zoo beneath us, and around a myriad of animal enclosures, the likes of which I’d never seen before, we trekked and trekked and trekked. Did you know Poland has its own kind of bison? Actually, let’s try that again: did you know Poland has bison? Or that in some species of reindeer even the females have antlers? How about the fact that there is more than one kind of giraffe and you can tell giraffe families apart by their spot patterns and colors? 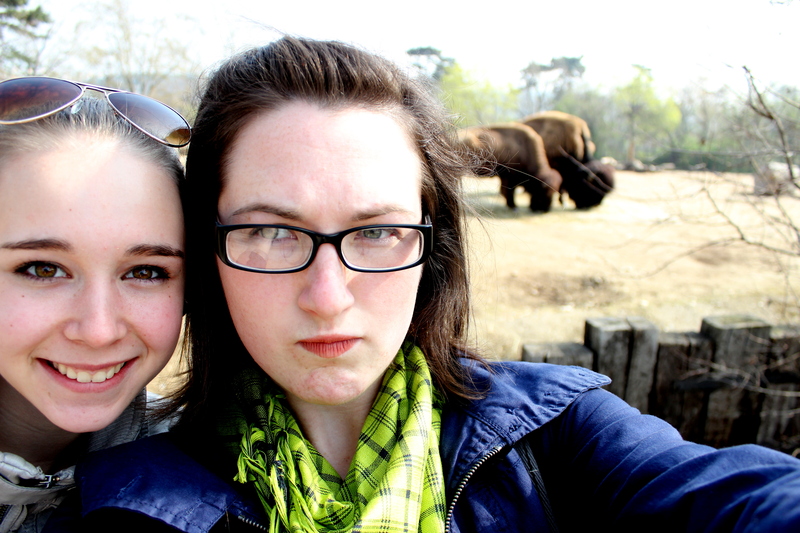 Me, our darling freckly blonde and some Polish bison. Some things about zoos will always be the same no matter where you are in the world. The elephants will be a disappointment, the meerkats will be the most entertaining exhibit and you will spend an inordinate amount of time waiting for a big cat or someone in the gorilla family to do something interesting and right when you think the golden moment has come, they’ll roll onto their other side and leave you staring awkwardly at their hindquarters. Food at the zoo is interesting. Lots of schnitzels. I want to mention that I have noticed that no one in this country (maybe this continent?) eats and walks at the same time. Is this weird? I feel like Americans eat/walk on a regular basis. Certainly we drink/walk. Not here. If you get a cup o’ tea at the stand, you find yourself a table and sit until that tea is totally gone. I appreciate the idea of taking time to truly enjoy one’s food, but I’m not sure if I’m physically capable of sitting while eating an ice cream cone. Must be something about the position of the spine… Anyways, how else are you supposed to tease the apes if not by eating things they can’t have? The thing about the Prague Zoo, aside from the fact that I imagine all the animals probably speak Czech in their inner monologues, is that when you get up high enough, you can see the whole city rolling out before you. It’s like standing at the edge of the world – or at least the edge of something steepish with a good view – directly beneath your toes is the animal kingdom representing countries from all over the globe, beyond them is the Vltava River, and past that is the sprawling landscape of Prague, crowned with St. Vitus’ Cathedral reaching toward the spotless sky. 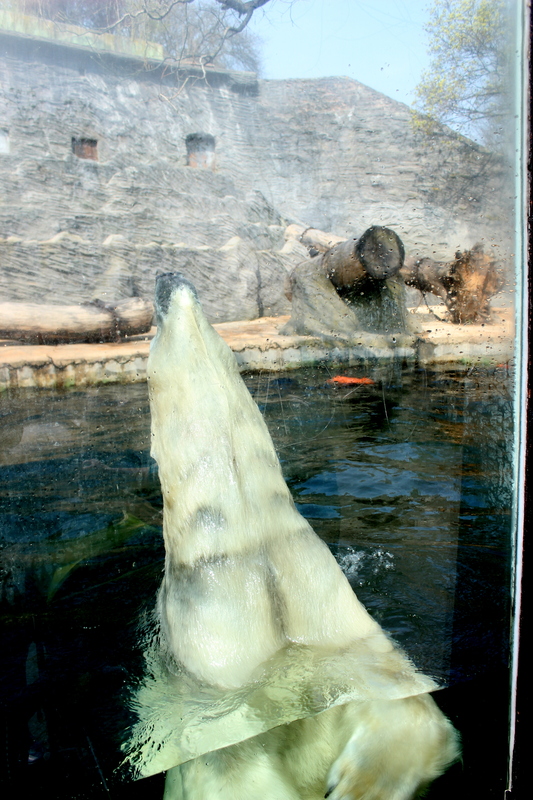 Prague’s zoo is kind of different, I thought to myself as I watched a very contented polar bear rush forward in the water, lift himself up right next to the glass and then lunge backwards again. (He repeated this unceasingly for the ten minutes I stood there watching. This is what happens when you take away the TV privileges…). My friend, the polar bear. What a nut case. Jarka and I met back up with the rest of the students at our designated spot and time and I was immediately quizzed on the Czech animal names. We spent our 45 minute ride back doing the “Which animal are you?” game with everyone in class. Some of us defy the animal kingdom and can only be fully described with mythological creatures. I don’t. I’m a bear. San Diego’s Zoo is grand. It’s huge and the enclosures are the most animal-friendly of all the zoos I have been to. It’s exciting and always full of life and distractions and people and animals. But honestly, I never really liked it. The zoo was fun because we went with family or friends. Some Saturdays I would wake up hearing my Dad singing Simon and Garfunkel’s “Something Tells Me It’s All Happening At The Zoo” from somewhere in the house and I knew that we’d be going to see those reactionary zebras again. I doubt we could afford it, but my Dad always bought us kettle corn or cotton candy. And when my legs got tired or it got too hot, I knew there’d always be a hand to hold and someone to tell me I should have brought a hat like Mom told us to. Prague’s zoo is great – really, a lot of fun – but I liked seeing the animals who were wandering around in sneakers and sweaters more than the animals who were picking bugs out of their ears (and for those who still aren’t clear on this, my students would be the former). My students are the ones who have revolutionized my expectations and imagination. They make every day a trip to the zoo. 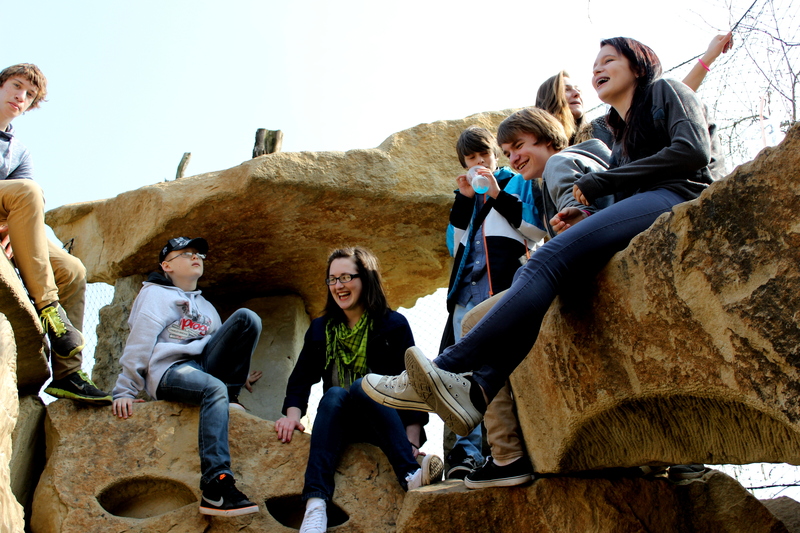 This entry was tagged adventure, animals, children, Czech Republic, expat, Prague, San Diego Zoo, school, students, travel, zoo. Bookmark the permalink.